A French drain is an effective solution to water problems in your home or yard. A French drain is installed beneath the surface of your yard or house, to help direct water away from your home’s foundation or other structures on your property. If you have issues with water in your basement after it rains or heavy water runoff puddling in your yard, you may want to consider having a French drain installed. Like with any home improvement project, it is essential to understand the cost of a project like a French drain installation. Pittsburgh Drain Guys have put together a breakdown of cost for a French drain to help you get an idea of what to expect before beginning your project. There are two types of French drains to consider, interior and exterior. Interior French drains are installed underneath your basement floor with a sump pump and are an effective solution to preventing flooding in your home. This type of French drain can be more labor-intensive to install, leading to a higher cost. An interior French drain is dug much deeper into the ground than an exterior French drain, costing roughly $50-$60 per linear foot. Costs can also be higher if you have a larger basement, requiring more than one sump pump, which cost about $176-$225 each. An interior French drain installation in a basement with a perimeter of 100 linear feet would cost about $5,000 to $6,000 total. An exterior French drain is only installed two to three feet deep to help move the water away from your property, making it less labor-intensive to install, costing about $10-$15 per linear foot for parts and labor with an average cost for installation around $1,000 to $1,500. Depending on your area, you may also need to acquire a permit which can affect the French drain cost. Pittsburgh area requirements can vary per municipality, so it is essential to check with your local municipality before you begin your project. It is also important to call 811 before you begin digging to make sure your project doesn’t interfere with any utility pipes or wires. 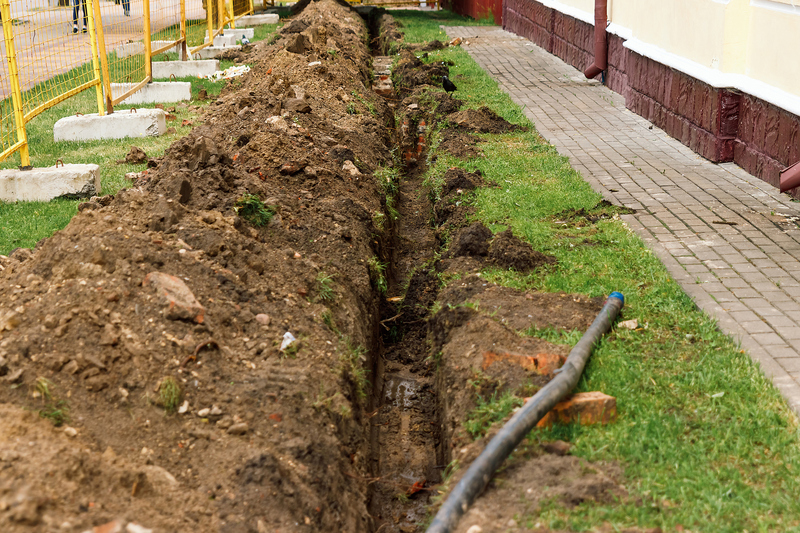 Interior and exterior drains require a lot of digging that can leave holes and damaged landscaping behind. To fill in the holes or repair your landscaping after the installation costs about $45-$75 per hour if you choose to hire a landscaper. You may consider adding an irrigation ditch to give the water a place to give the water the French drain is redirecting a place to go rather than letting it get close to the house. A professional landscaper will charge roughly $.50 – $1.00 per square foot for this service. If you have excessive surface water, you may consider using a retaining wall to prevent soil erosion. For a six-foot-tall, 50 feet long retaining wall you can expect to pay roughly $13,700 for installation. Contact Pittsburgh Drain Guys today to learn more about our interior and exterior French drain installation services and how we can help you fix your water-logged yard or basement! French Drains 101: What You Need to Know!